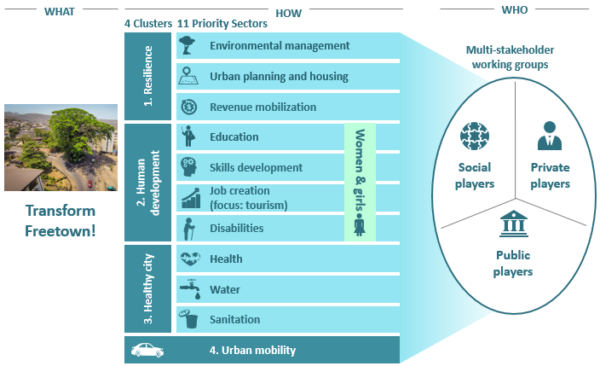 The freetown City Council undertook an extensive bottom-up consultation effort to assess the needs of all 310 communities in the city. In August 2018, a comprehensive needs assessment of residents' views of service delivery was undertaken through 310 meetings which were held at zone level. 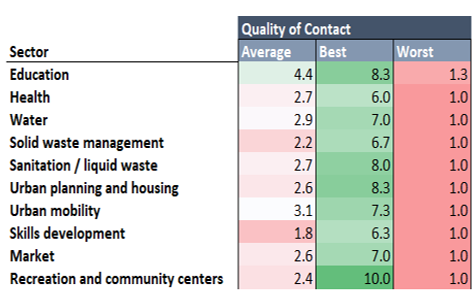 This is the first time a city-wide consultation of this scale, captured service-level resident satisfaction data for the purpose of developing a strategy. 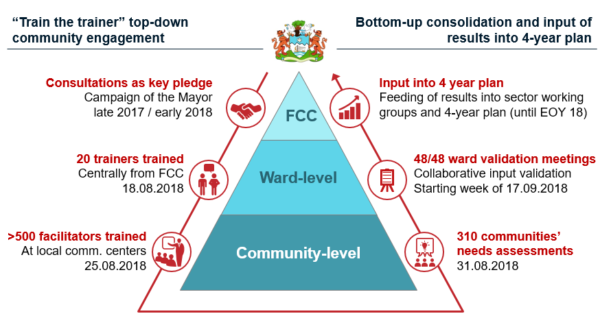 This allowed Freetown's zones to reflect on FCC's service delivery record and present their priorities. These meetings were attended by ward committee members, various community stakeholders, councillors, youth groups, religious groups, women's groups; and facilitated by 500 trained facilitators including members of the Federation of Urban and Rural poor (FEDUP). During September 2018, the data from the zonal meetings was reviewed in a series of meetings held in each of Freetown's 48 wards, with the Ward Development Committees. These meetings allowed data from the zonal meetings to be subjected to a further layer of validation, and ensure consensus on the priorities identified. 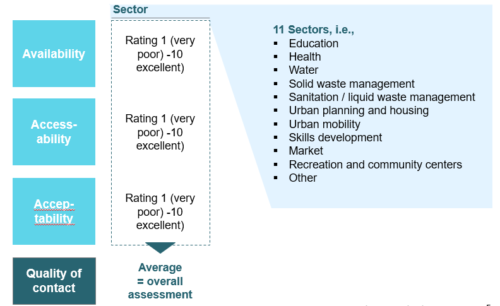 Worst-rated sectors are sanitation and skills development, with an average of 2. Water only has an average of 2.9. 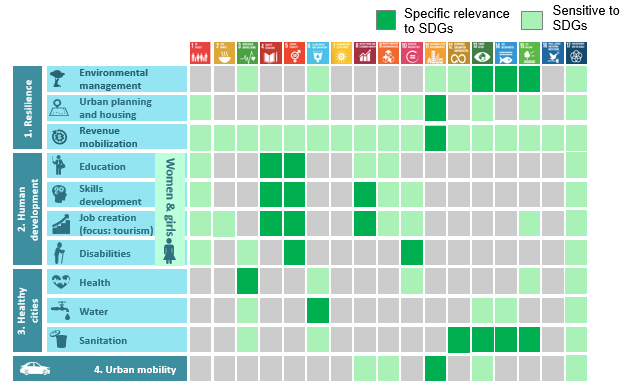 Multi-stakeholder working groups comprising councillors, FCC staff members, representatives from the government, NGOs, development partners, community representative, members of the public, and members of the private sector were formed for each priority sector. Their expertise is helping clarify the issues and develop the solutions that will enable FCC to deliver the Transform Freetown agenda. 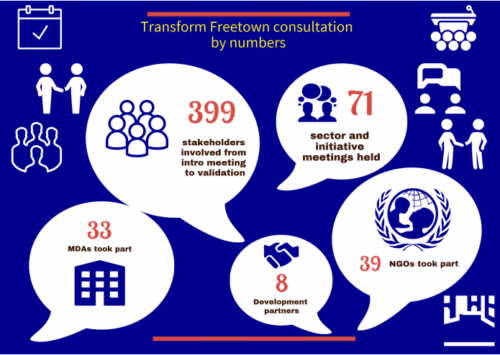 Outreach efforts acknowledged that not all Freetown's residents have access to formal channels of feedback. The planning process therefore incorporated a facility for online input with the launch of FCC's first website and Facebook page, one-to-one meetings, an open-door policy and a community walkabout programme. 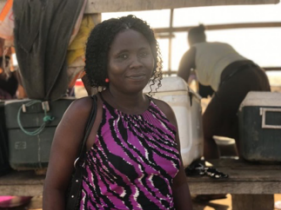 "The boost in the Tourism sector is very beneficial to us selling at the beach and we pray that the government continues to invest more in that department."